I'm having some people over this weekend and the house needed some cheering up.... 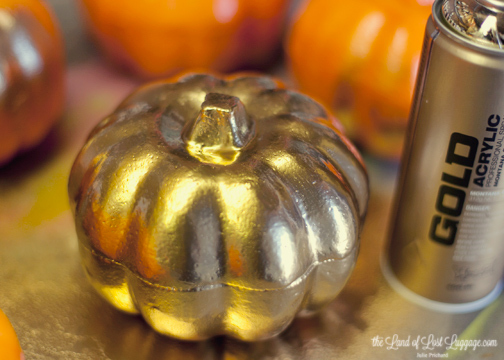 I wish I could run out and drop $100 at a cool shop for decor, I can't... as I cruised the interwebs, I came to realize metallic decorations were all the rage...and lucky me...I have metallic paint. Dollar store foam pumpkins. In order to best receive the spray paint, they need some surface prep. Matte medium, gesso, use anything. Just a quick coat. Allow the surface prep layer to dry. 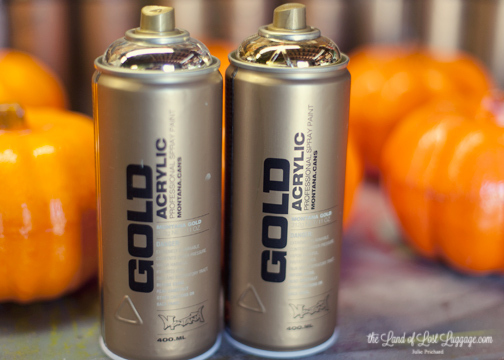 I use Montana Gold spray paint. Gold was on my mind today..
Cover with paint. I used one coat. Allow to dry. 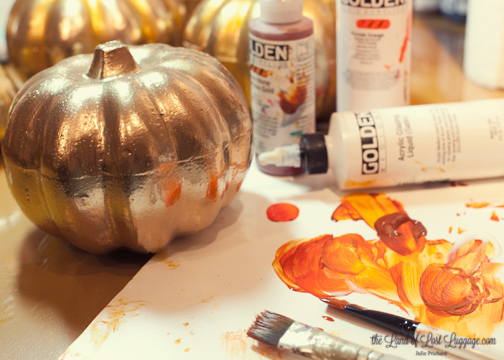 To bring the pumpkins from their $3 state up to a $15 look, I glazed on some Quinacridone Nickel Azo gold paint plus Vat Orange. The Acrylic Glazing Liquid (Golden) allows a long working time so I can lay in some color and then come back in with a clean brush to blend it around. I applied some of the orange mixture in all of the dips. 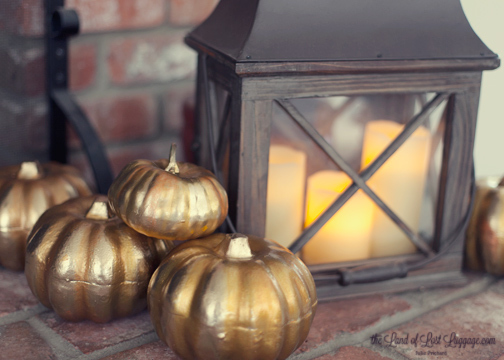 Once everyone is all dry, pile these around for instant fall charm. Love the hint of orange glow in the dips. Fast and Fancy Backgrounds. Free Workshop. Part 4. Pin this: Studio Pen Organization a la cheap and cheerful..